The Rappaz Museum is located in the historical heart of the city of Basel, more precisely in the former house of the weavers of the Klingental Convent, which served as a workshop for the eponymous graphic designer Rolf Rappaz (1914-1996). It presents a permanent exhibition on the work of this Basel artist and graphic designer. The museum also presents itself as a true centre of art and living culture, its objective being to bring together regional artistic production and a globalized perspective of art. Rappaz's work is the starting point for this process, which has marked both the history of world art and the history of Basel art through three decades of creation. 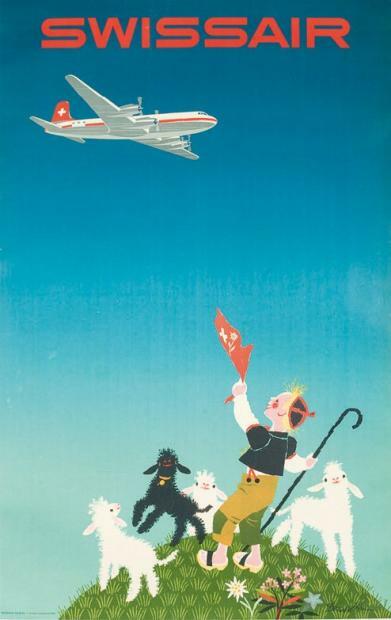 Rolf Rappaz starts his graphic design apprenticeship at Frobenius A.G. in Basel (a poster by swissair, 1954). Initially an independent graphic designer, he turned to the fine arts in the mid-1960s. In 1938, he co-founded the Swiss Graphic Designers Union. Master at the School of Applied Arts in Basel (1942-1945), he had a great influence on a whole generation of artists, including Eva Aeppli and Jean Tinguely. Founding member of the Association des graphistes créateurs (1951). In 1958, he designed the tourism pavilion at the Brussels Universal Exhibition. He designed dozens of posters for the Swiss Exhibition in Basel, Olma, Swissair and Annabelle magazine. And in the middle of these geometric canvases, some more childish silhouettes... but still geometric! Trump was a graphic designer!